A collection of dreams and fantasies. We had to drive across the country recently to get to a sporting event. We were both rather tired and it was the last leg of the trip. It had already rained and the sun was just barely peeking from behind the clouds. I was driving and the cement on the road had seen better days but I had also seen worse roads than that one. All of a sudden, we see a hitchhiker. "Where to, friend?" I ask him as he gets on. "Oh, jast diawn the road at the manastery." He had the lilty accent of the locals. Very picturesque. "Very well. Just tell us where to stop." He seemed unused to the car trip and gripped the side of his seat a bit shakily. I decided to drive slower for his sake. "Are you ok? Sorry if my driving is too fast." "No, it is fine. Viry camfy in yer car." He wiped his brow. "Oh. The manastery." I stop and, sure enough, there was our camp right across the street. "Thenk yee. How mich do I pay?" "Nothing at all, this is also our stop." I smiled and my husband offered to help him down but our hitchhiker refused. "Thank yee, thank yee. I am fine. Ghid day." He definitely doesn't go by car that often. 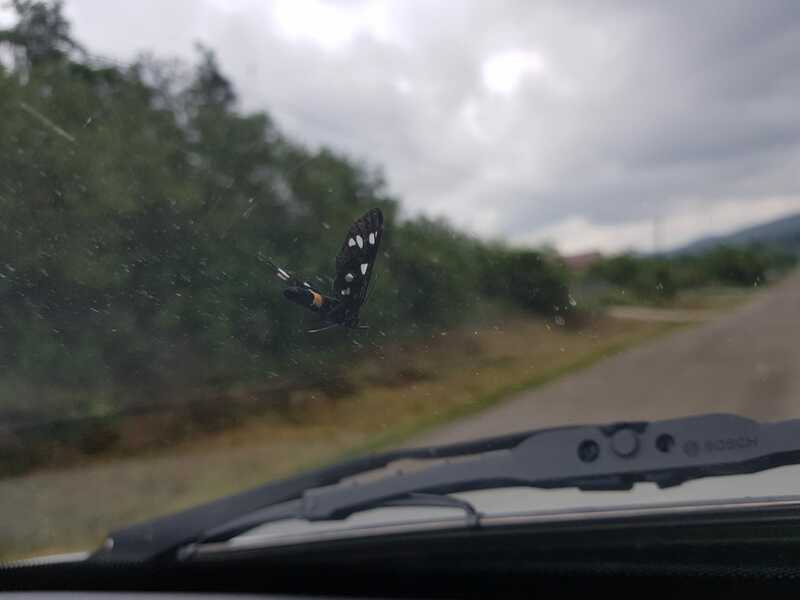 Poor thing was so scared he didn't want to fly away not even when we stopped so we let him be. He eventually felt safe enough to leave. Sending you warm wishes for a fun-filled, happy year ahead. Know that you are missed. "The Relativity of a Corroded Mind"
Download the free e-book here or order the paperback version here, both at Blurb. I come and go... I rarely stay too long. Where Do all the Dead People Go? Copyright © 2011-2018 Lavi. Background by WallpapersWide.com. Powered by Blogger.